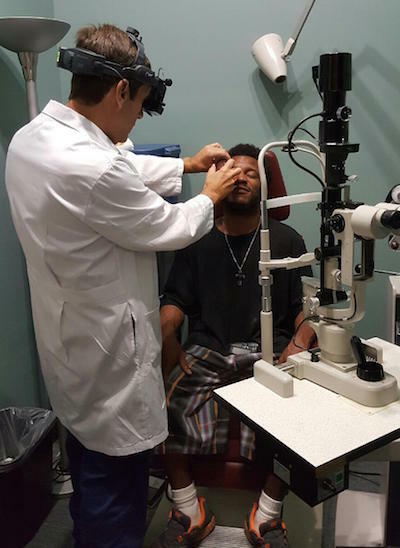 Dr. Milton Grin spent his Sunday morning at the Kansas City Free Eye Clinic giving free eye care to people who are uninsured or underinsured, many of them homeless. The KC Free Eye Clinic is a non-profit organization entirely run by students, mainly medical students from UMKC. Volunteers, including ophthalmologists, optometrists, opticians, and ophthalmic technicians, give their time and skill free of charge to deliver quality eye care to those who would otherwise go without it. Dr. Grin has traveled the world to participate in medical missions, but he most enjoys giving back right here at home.